« Join us at McNally Robinson on July 25th for the Launch of our Latest Issue! 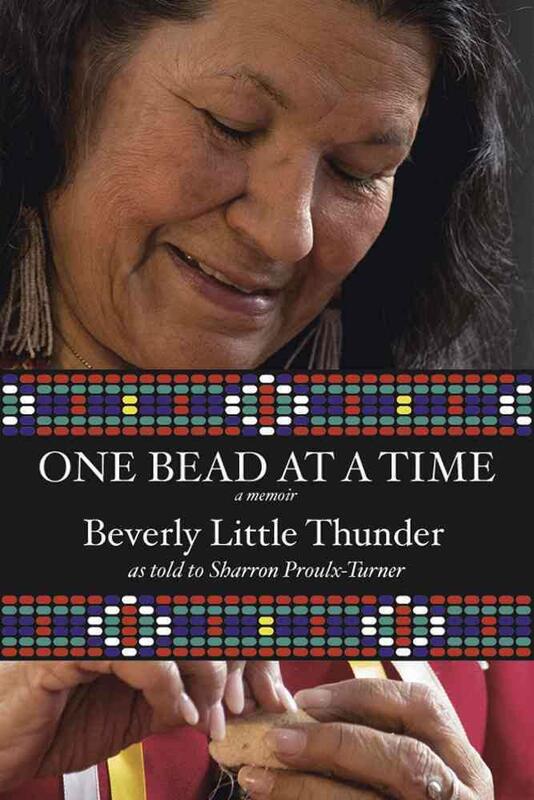 In a time of truth and reconciliation, One Bead at a Time: A Memoir by Beverly Little Thunder, is a book that should be read. This memoir is an oral account of her life stories that have been transcribed by Sharron Proulx-Turner. Beverly’s story originates with her Indigenous family roots of North Dakota and stories of her grandmother and great grandmother, followed by her own mother. Between attempts to raise chickens, learning Lakota and experiences of poverty, cherished memories connect the collection of stories throughout. Beverly’s own parents met in the army. Her mother, a spirited women dropped out of university as Indigenous women at the time were only permitted to be nurses or teachers and she wasn’t a fan of children or blood. Joining the Women’s Army Corps, she met Beverly’s father. The book is a gem of family secrets, some hard and unfathomable, others utterly joyous. However, during the decades of stories we learn of the shadow looming: Beverly’s sense of abandonment and disassociation. The memoir does not hold back and her humour threads amongst the stories. Two-spirited, Beverly’s first date with a woman, comically, happens during the 1981 wedding of Charles and Diana. Who remembers what they were doing at the time of this royal wedding? How many others were glued to the TV eating toasted tomato tea sandwiches, watching the ceremony with my great-grandmother as I was? Meanwhile, in another part of North America, Beverly is watching the ceremony on TV with her first female date. “Placing one bead at a time, planting one seed at a time, and taking one step at a time—like the young girl with the star fish—I know I can make a difference in each life I touch: one person at a time,” Beverly reveals (212). 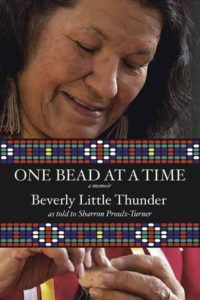 The significance of beading in Beverly Little Thunder’s life meaningfully links stories throughout One Bead at a Time: A Memoir. From the Indian Movement to Sundancing, an enormous reward to readers is learning not only about Beverly’s life, but of her accomplishments serving both Indigenous and non-indigenous women in North America in her own words. E.D. Woodford is a Métis writer and co-founder of Wildflower Writing Workshops focusing on auto-ethnographic creative non-fiction and poetry. She is author of Wild Hearts, Gypsy Soul, a collection of auto-ethnographic poems based on poetic inquiry. She is a cultural anthropologist and Indigenous researcher, Learning Consultant, and Post-Secondary Instructor. Her recent academic research has been published in Transformative Dialogues and the CAPS Journal.